My fascination with Arabesque ornament... may have begun in Prague many years ago, when I first saw the Španělské Synagogy "Spanish Synagogue", built in 1868 in the Moorish Revival style. 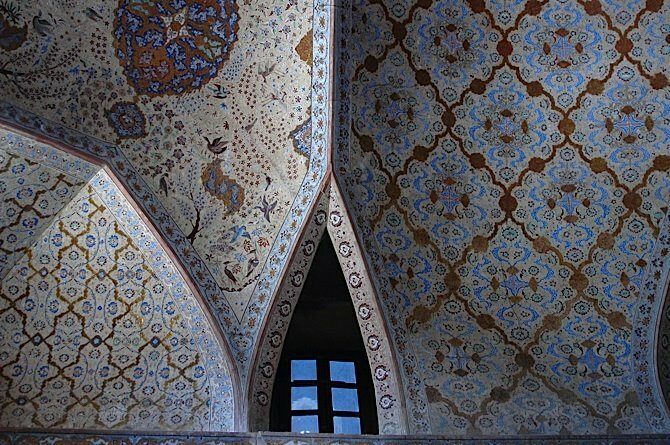 Inside it is completely covered in geometric Arabesque designs. Seeing the architectural ornamentation on such a scale made me want to run home and encrust every surface I could find with pattern. It's not just that it's pretty, but it resonates with the math geek in me. The division of space, the arrangement of color, the... fractals! 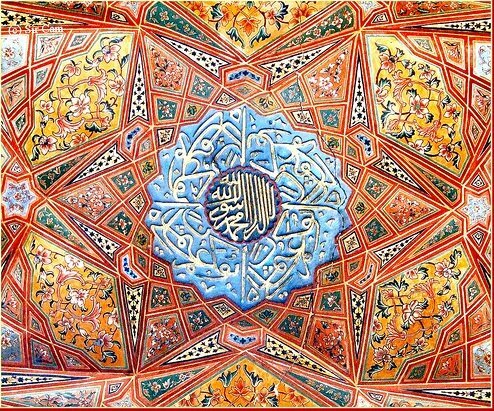 Arabesque art developed in regions where Islam has been dominant; such as Morocco, Moorish Spain, India, Turkey, and the Arab states; and embodies Muslim precepts in its themes, with the focus on patterns rather than on figures. 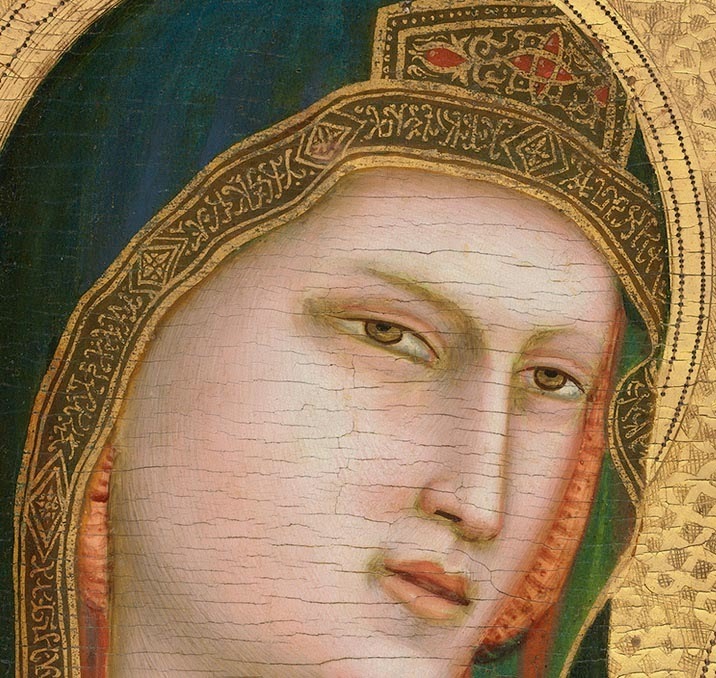 The depiction of the human form is forbidden, considered too close to idolatry, and so the art tends to be decorative and ornamental in style - geometric, floral, calligraphy. 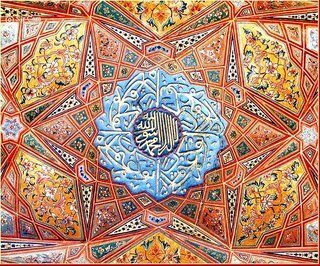 The style has inspired and influenced non-Islamic ornament and architecture in Europe and elsewhere, particularly in the 19th century with the trend towards in Orientalism in design, and romantic "revival" styles of architecture. 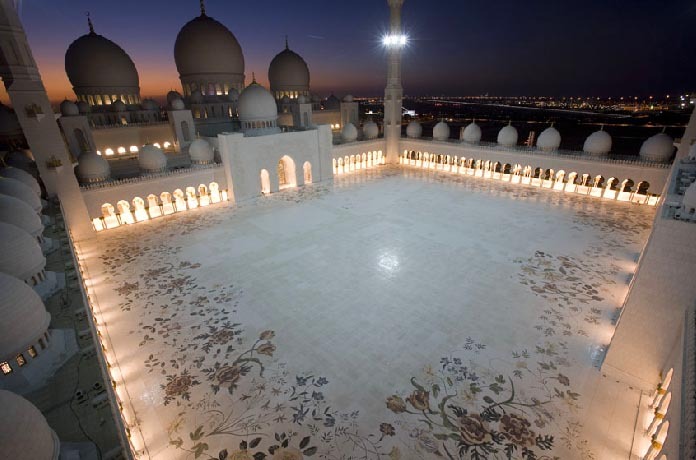 The incredible new Grand Mosque Abu Dhabi is a project that I have been watching with interest. 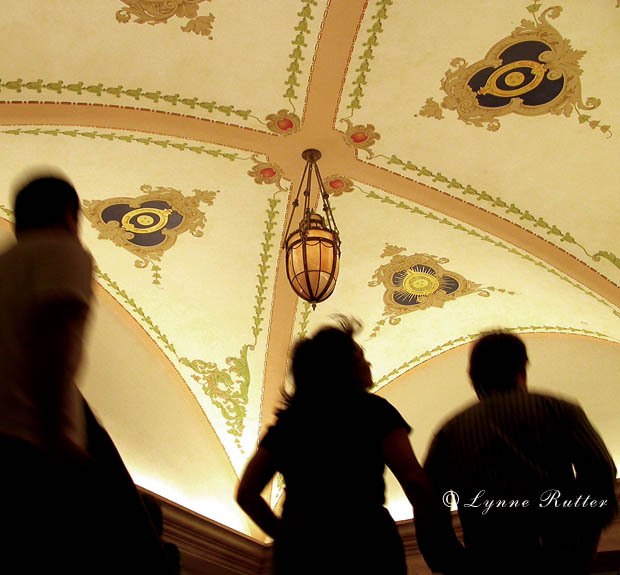 It was completed in March, 2008, and I am especially gleeful over the work of British designer Kevin Dean included in the massive courtyard's inlaid marble floors (above) and archways, a fantastic modern take on the floral elements of this style. 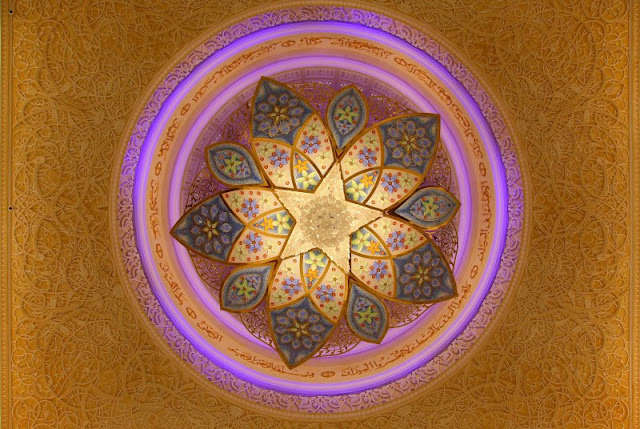 More gorgeous pictures of this splendid new mosque can be found on the photography site of Imran Akram. Mosaics can also play a prominent role in the ornamentation of buildings. In addition to the overall appearance of a colorful pattern, the play of light over the surface of thousands of tiles adds another level to the message of this art: this all fits together in an infinite pattern... do you see now, how you too are part of a larger pattern, how you belong? 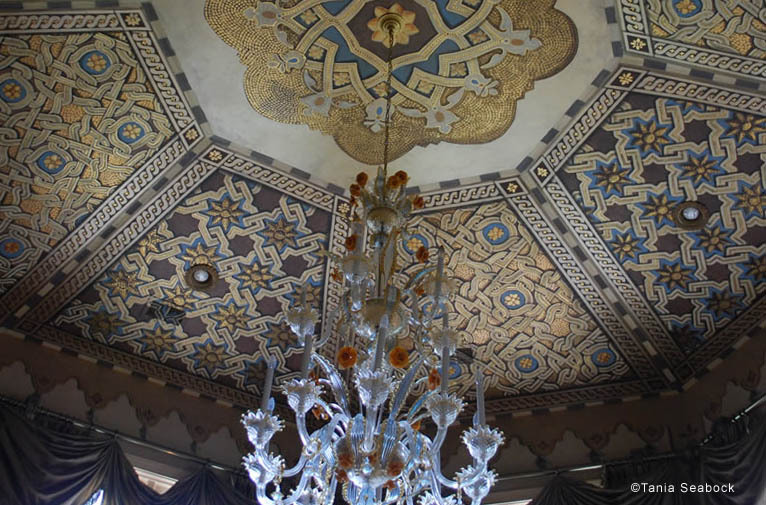 How envious I am of my friend and colleague Tania Seabock, for this incredible ceiling she created for a client in the arabesque style, which includes tens of thousands of gold faux mosaic tiles! 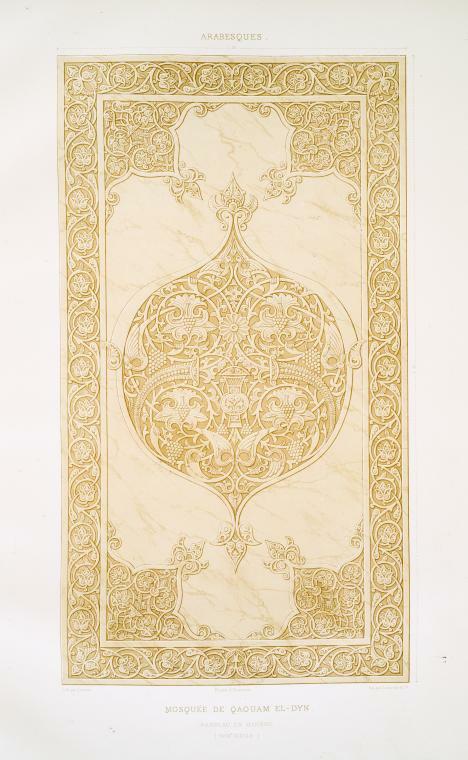 I have a room set aside for my own spin on arabesque ornament, and look forward to sharing my inspiration and progress. Thanks for posting this Lynne. Spectacular stuff! Thank you for post and the useful links! Math is art and often (maybe always), vice versa. Sicily is full of beautiful Islamic art and architecture. Thank you for leaving the link to yellow on my blog. I responded there and sent you an email (which got spat back). I am featuring two rooms soon, full of stencilled patterns vey like the designs shown in your post. Great Post, I am especialy interested in this topic as I am planning on doing a hand painted and stenciled ceiling in the Gentlemans Parlor of our 1871 Second Empire cottage we are restoring. Most of our furniture is from the Victorian aesthetic movement and I find Moorish and islamic design works well together. I as well, Paul and i am terribly behind in getting it started!